Did Jesus condone sacred violence? While earlier writings in the Hebrew Scriptures described instructions from God concerning human and animal sacrifices, the later prophets condemned animal sacrifices. (See parts 19 & 23.) Jesus echoed Hosea 6:6 when he said, “Go and learn what this means ‘I desire mercy, and not sacrifice.’ For I came not to call the righteous, but sinners” (Mt 9:13). In this passage, Jesus defended his eating with tax collectors and sinners, whom the people despised. The people scapegoated these people by ostracizing them, but Jesus had compassion for them. Jesus expanded on this theme in Mt 12:5-7. In response to the priests criticizing his disciples for plucking heads of grain on the Sabbath in order to eat, he said, “…have you not read in the law how on the Sabbath the priests in the temple profane the Sabbath, and are guiltless? I tell you, something greater than the temple is here. And if you had known what this means, ‘I desire mercy, and not sacrifice,’ you would not have condemned the guiltless.” Though Jesus was evidently referring specifically to his “guiltless” disciples, I think that Jesus was providing a more profound teaching. First, righteousness is not determined by temple practices, and a principle function of the temple was to perform animal sacrifices. Second, if people were merciful, they would not engage in “sacred” violence. Consequently they would not condemn the guiltless, which is what happens whenever they become embroiled in scapegoating. Significantly, animals were the guiltless victims of the sacrificial cult in Jesus’ time. 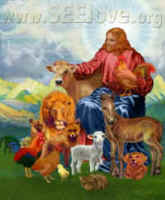 It is noteworthy that, in disrupting the animal sacrifices in the Temple, Jesus liberated the animals as well as turned over the money-changers’ tables (John 2:15). Next week, we will explore Paul’s letter to the Romans, in which he said, “I appeal to you therefore, brethren, by the mercies of God, to present your bodies as a living sacrifice, holy and acceptable to God, which is your spiritual worship” (12:1).